Luxury German kitchen manufacturer, SieMatic, has always focused as much on the quality and design of its kitchen interiors as it has on its stylish and timeless exteriors. Now the company has won two prestigious awards for its latest personalised interior storage system, which makes it easy to keep everything in its place while also looking beautiful. The interior system has been awarded the iF product design award from International Forum Design, Hannover and the 2014 Red Dot award for Product design in recognition of the flexibility of this unique system. 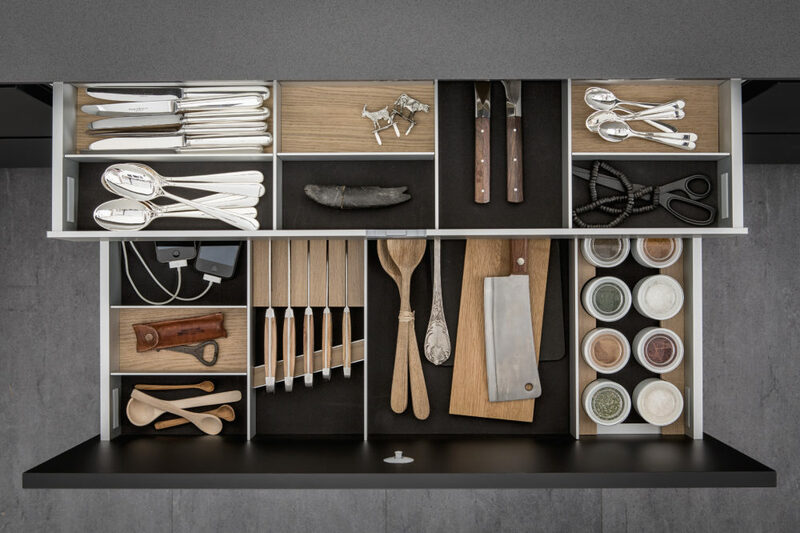 The inherent flexibility of the new interior storage system is best seen in action and can be viewed through a stop motion animation which can be watched on the SieMatic website here. SieMatic’s UK Managing Director, Bernard Otulakowski comments, “It’s fantastic that the unique flexibility of our new improved interior storage systems has been recognised. It gives the user the flexibility to change the interior spaces of the drawers as and when they need, meaning that their kitchen will always be efficient and a pleasure to use”. The new range incorporates innovative and highly functional intersecting aluminium panels can be used to compartmentalise the interior space of the drawer. The insert panels can be added, moved or removed at any time to accommodate items of different sizes. This allows the interior to be personalised making it completely individual to the user and helping to keep things organised. The new system features an extra deep king-size compartment that provides 50 percent more storage height, achieved by lowering the drawer bottoms so that large utensils can be stored. The internal base of the drawer also provides further room for customisation and a choice of materials. Decadent and timeless, the new dark smoked chestnut finish is the perfect choice for creating a dramatic backdrop for cutlery and utensils. This finish is not painted or stained; it’s smoked to ensure a depth of colour that will not pick up light scratches. SieMatic’s popular light oak option is also available for a brighter and more Scandinavian style look. A third option can also be applied to the base of the drawer which gives the contents added stability; SieMatic’s new Flock2Block. It provides a secure surface and it comes in a dark grey finish which co-ordinates well with the other finishes. This non-slip material is also partially applied to the base of the internal components such as SieMatic’s porcelain containers. This forms a strong connection between the drawer and its contents, preventing movement which could lead to damage or disorder to the contents. This innovation is currently patent pending. A new integrated USB charging station can also be integrated into SieMatic’s internal cabinets and the Flock2Block surface is used to protect tablets and smartphones from scratches.